today's polish is Julep Ginger. 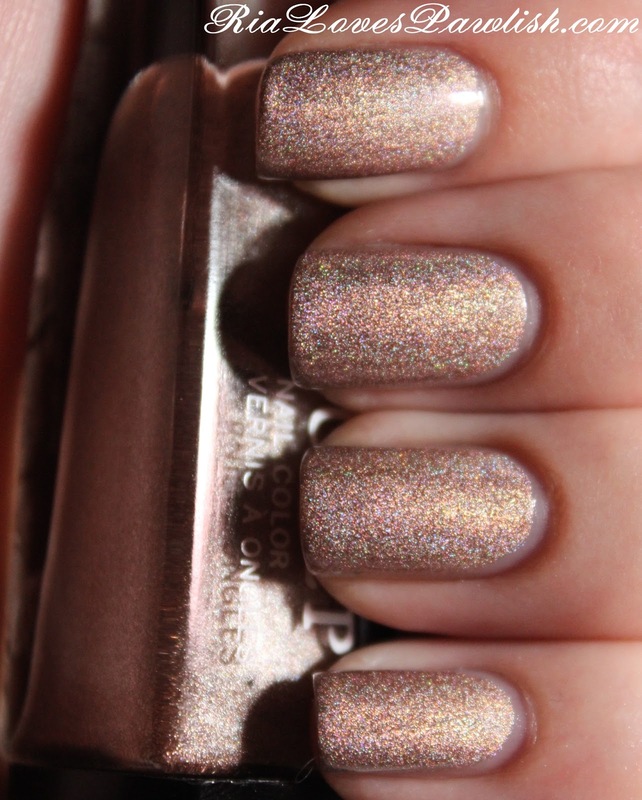 it's a light bronze polish with a faint linear holo in its finish. 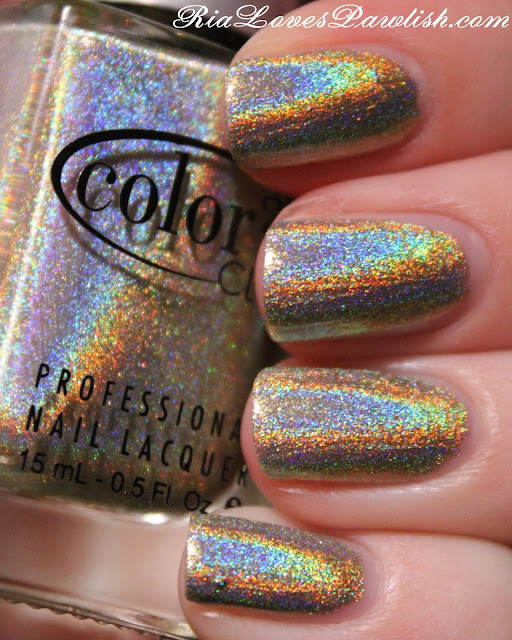 i have to say i'm disappointed, i was hoping the Julep holographics would be... well... HOLOGRAPHIC! it is still a beautiful polish, and if i wasn't spoiled by the super strong holo effects from Layla, i would probably be more impressed. this polish is easily opaque in two coats... and strangely, the holographic effect actually appears stronger when topcoat is added... which is opposite of how much holographic polishes react! two coats Ginger, one coat Seche Vite. the hologram was pretty shy on camera, but i captured it a little bit! if you are someone put off by really in your face holographic polishes, this is an excellent alternative. it's also one i think you could get away with at the office... neutral color with just a little added something to make it special. i was lucky enough to be at the barn yesterday when the farrier came to trim Aramis' feet... so, i got to watch a horsey pedicure :D i learned that horses' hooves are really similar to human toenails... i had no idea they had so little feeling in their feet and that the hoof is trimmed back, just like a giant toenail. pretty cool! 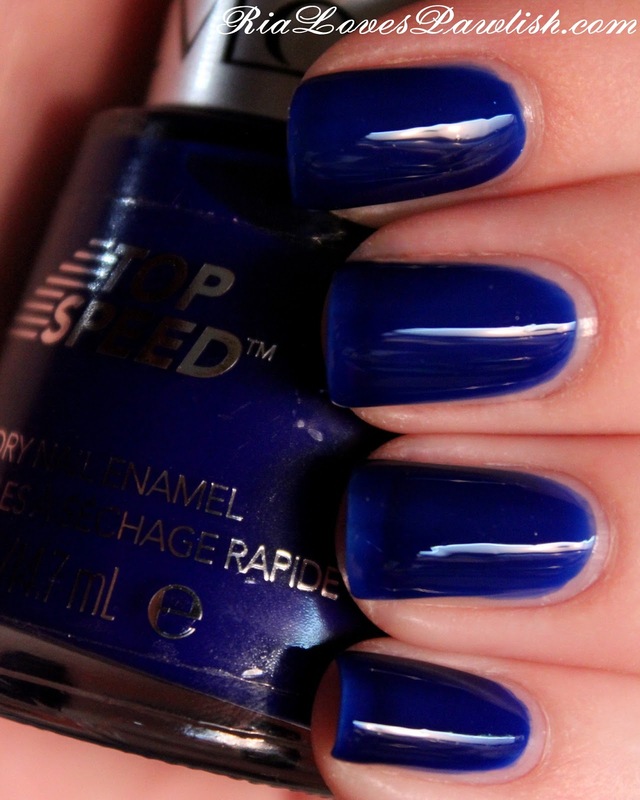 today's polish is Revlon Top Speed Royal. it's a deep blue polish with a jelly finish. the color is beautiful, but i'm not a big fan of the formula. it refused to stay at the tips of my nails, even though i added extra polish to the tips between coats AND wrapped them. even with three coats, there was still a bit of visible nail line as well. i really wish this polish was more opaque, because the color and finish are stunning! it dries shiny, but really comes alive with a shine topcoat added... super glossy. three coats Royal, one coat Seche Vite. the VNL is a bit less noticeable in person... it's like the camera has X-ray vision! i have finally gotten everything together for the big China Glaze Glitz - Bitz 'N Pieces post! this collection is really beautiful... you can't go wrong with any of the polishes in it. all the polishes are glitters consisting of a single color hex glitter and multiple sizes of black hex and bar glitter pieces, all in a clear base. all the polishes have pretty much the same formula, quite packed with glitter and fairly thick. 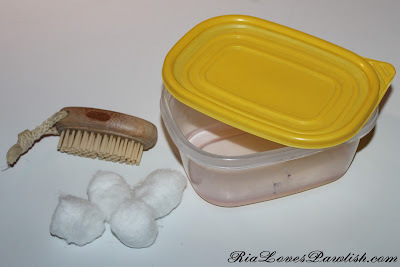 it applies a little clumpily, but you can work with it and get it spread around pretty evenly... then pat pieces onto any bald spots. the giant hex pieces don't come out as much as the other pieces, so don't expect to get one on every nail. it dries fairly smooth, but it looks even better with an added coat of topcoat. to really showcase these glitters i used China Glaze White On White (a white creme) as the base for each swatch. each swatch has one coat of glitter (with some placing and the occasional second coat), and they are all topped off with one coat of China Glaze Fast Forward Top Coat! let's kick off with Mosaic Madness... the colored glitter is a rich, warm blue... almost peacock colored. this is my number one pick from the collection! next up we have Bling It On, a light periwinkle blue leaning purple. i thought that Mosaic Madness and Bling It On would be similar... but they actually aren't close at all. then we have Glitz 'N Pieces, in which the colored glitters are silver! next we have Scattered & Tattered, in which the colored pieces are red. 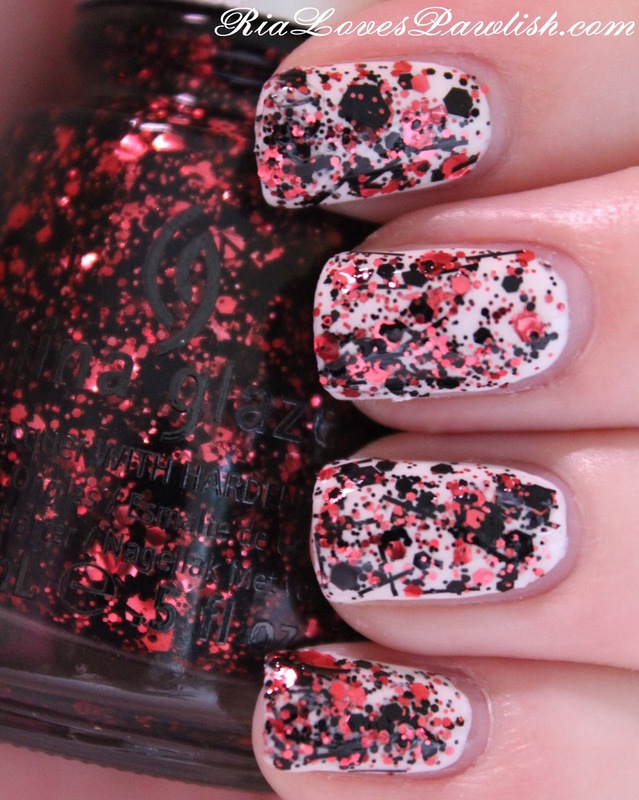 i love how this whole mani looks, it feels like it would have been perfect for Valentine's Day! 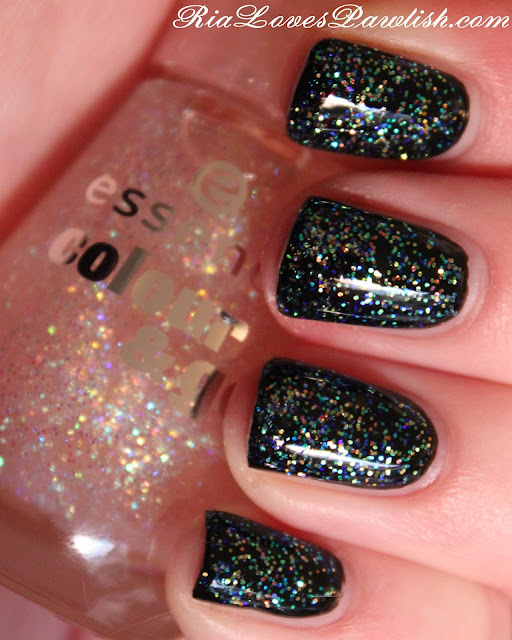 lastly we have Graffiti Glitter, which contains rich emerald green glittered. i love how saturated and vibrant the green is! the Glitz - Bitz 'N Pieces collection is available where China Glaze products are sold... i saw the collection in a display at Ulta over the weekend! be sure to check out China Glaze's website... www.ChinaGlaze.com. 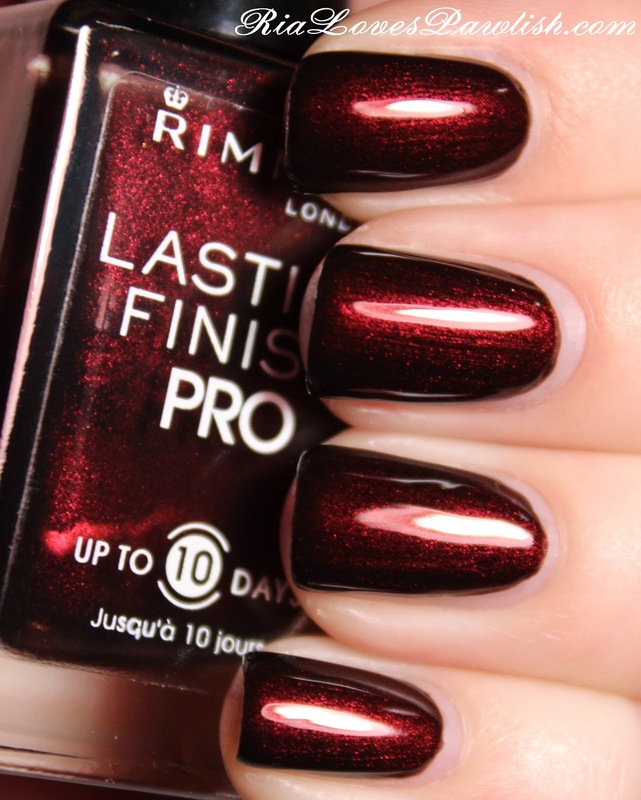 today's post will actually be on Rimmel London Lasting Finish Pro Lava Red, a deep burgundy polish with red shimmer. this polish is so dark that it looks dark brown where the light isn't hitting it... i absolutely adore colors like this! the formula is good, it only took two coats for full opacity... but it wanted to thin out really badly at the nail tips. to combat this, between coats one and two i added a coat just to the very tips of the nails... and that solved the problem beautifully! this dries pretty glossy on its own which is lovely, but i added topcoat to aid the drying process. two coats Lava Red, one coat Seche Vite. i have yet to find a polish from the Rimmel London Lasting Finish Pro line that i haven't liked... can't go wrong with these babies. today's polish is China Glaze Some Like It Haute, a charcoal glitter with bright silver microglitter and large holographic pieces. the finish on this one is pretty interesting, it almost gives that textured effect that's so big right now! this is one you could probably get opaque on its own, but i did layer it over my SpaRitual Back To Your Roots mani... i actually thought it was going to much less opaque than it turned out. it completely covered Back To Your Roots in two coats! this does dry a bit rough (giving that textured effect), so you may want to add topcoat to smooth it out. 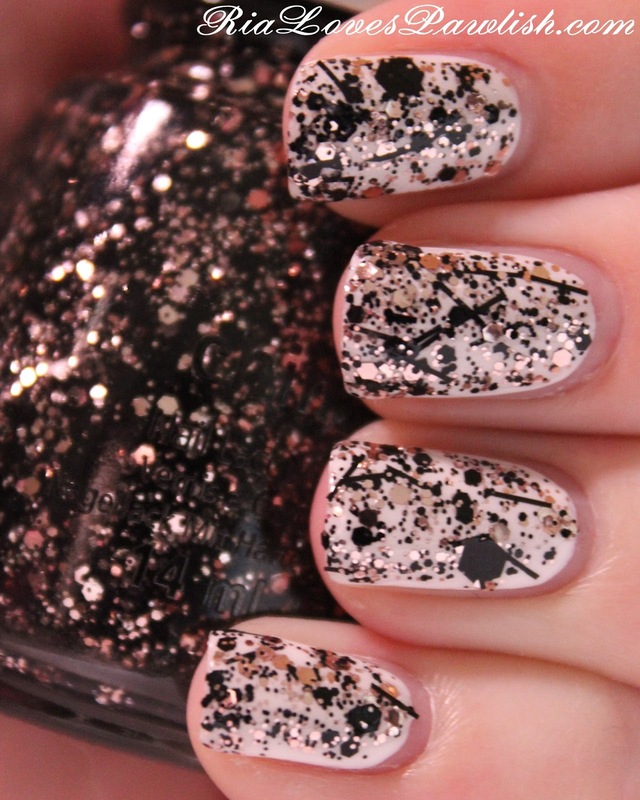 topcoat also makes all the glitters more sparkly! two coats Some Like It Haute, one coat Seche Vite on pinkie and middle fingernails. it was freezing today... i actually had to wear a jacket while i was riding, which is pretty unusual for me... i'm generally hot all the time! the forecast calls for rain tomorrow, but i hope the weather changes its mind... and if not, i hope it's at least dry enough at the barn for lessons on Wednesday. 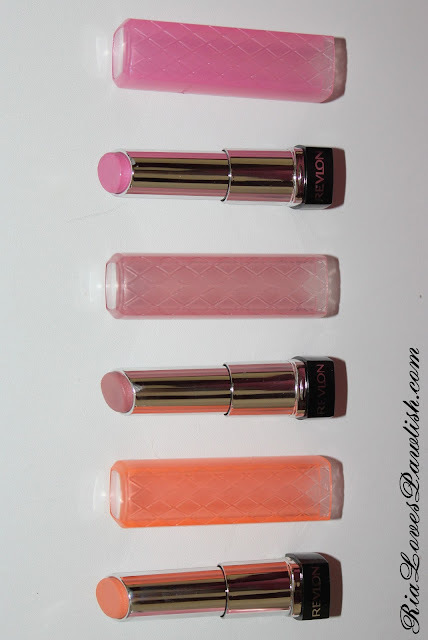 today i want to share a review of Revlon ColorBurst Lip Butters! these have been getting loads of hype lately, so of course i had to check them out. this is how they're packaged, no complaints other than it took a few days to get the tops loose enough to be able to be removed easily. these are pretty moisturizing, even for lips like mine that are always pretty dried out (owing, ironically, to overuse of lip balms!). the consistency is fairly thick, which i like in a lip product. i do wish they were more opaque... but they are actually made to be sheer, so that's just my personal preference. they can be built up nicely, which is how i use them. the very tops of the lids are clear, so you can see the actual product color before you buy it... i would say not to be afraid by how bright/dark they are, as they are pretty sheer which makes them much more wearable on most skin tones! here are swatches of the three i picked up... my favorite is Cupcake! 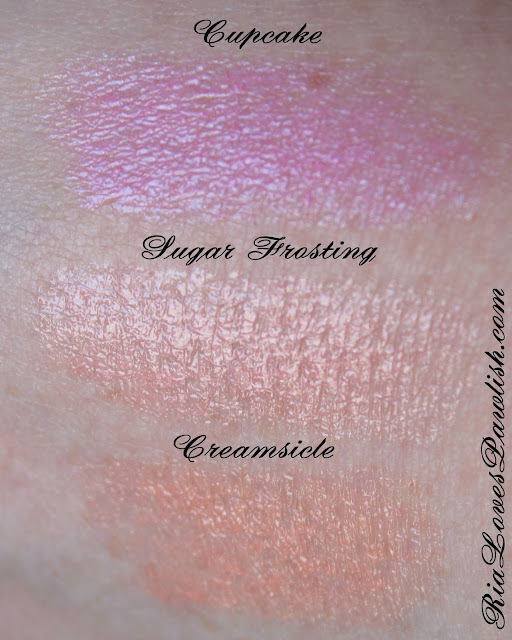 Sugar Frosting is pretty close to my natural lip color (which is pretty light) and Creamsicle goes fairly beige on me. these go for around $8, but drugstores are always running sales like buy one, get one 50% off, and Ulta currently has Revlon buy two get one free! 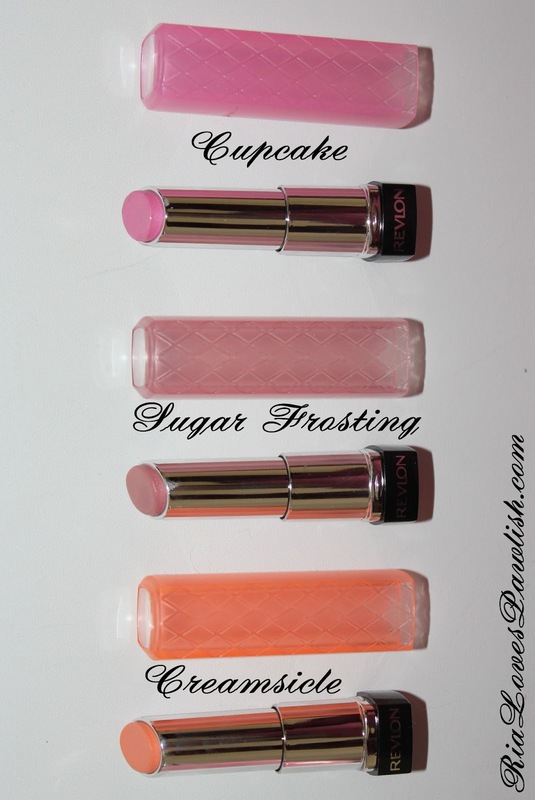 bottom line... i would repurchase probably all three of these, and i definitely plan on trying out some other colors! let me know if you'd like to swatches of other shades. this weekend has just flown by... it seems like they always do! Mr. Pawlish actually gets the day off tomorrow, i'm not sure if he's going to come to the barn and keep me company or not. he's got lots coming up next week at school... it never fails to make me glad i'm not the one in school! today's polish is OPI Congeniality Is My Middle Name, a polish from their Miss Universe collection. 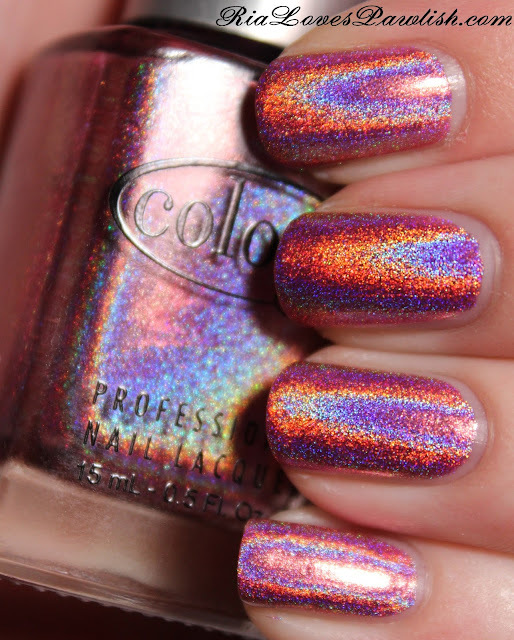 it's a warm berry with lots of pink and blue shimmers and is medium sheer in its opacity. you could leave it at two coats, but i felt it looked a lot better at three! it looks a bit more like a jelly in the photo than it does in real life... the camera really picked up on the sheerness. it's really beautiful with lots of sparkle, but it does benefit a lot from a shine topcoat to keep it from getting a bit dull. three coats Congeniality Is My Middle Name, one coat Seche Vite. for some reason you can see a lot more visible nail line than you can in real life... not sure why the camera did that! i am becoming an avocado fiend! they are so good on sandwiches and (obviously!) in guacamole. they are full of things that are good for your skin and hair... if only they were low-fat, too. nothing's perfect! today's China Glaze Avant Garden polish is Tart-y For The Party. i can't tell you how much i love that name! i'm a huge Real Housewives addict (HUGE), so of course i'm instantly thinking of Kim Zolciak's Tardy For The Party song :) this polish is a lavender creme with almost beige undertones. the formula on this one is another that you need a steady hand because it's slightly runny, but the coverage is great... only two coats for full opacity. it dries glossy on its own, but i did add topcoat to help it dry faster! two coats Tart-y For The Party, one coat China Glaze Fast Forward Top Coat. today i have a fun new collection from Layla to share with you all... Caviar Effect! this collection has 12 colors and can be used with any nail polish as a base. they are teensie tiny beads in a couple of different sizes that really adds dimension to the look. the packaging is a regular Layla bottle with an extra bit of plastic around the opening of the bottle to help the beads to come out nicely and not run all over the place! the color i'm showing today is 01 Cha Cha Cha, a bright, blingy silver. i layered it over Layla Ceramic Effect 61 Ipanema Girl. 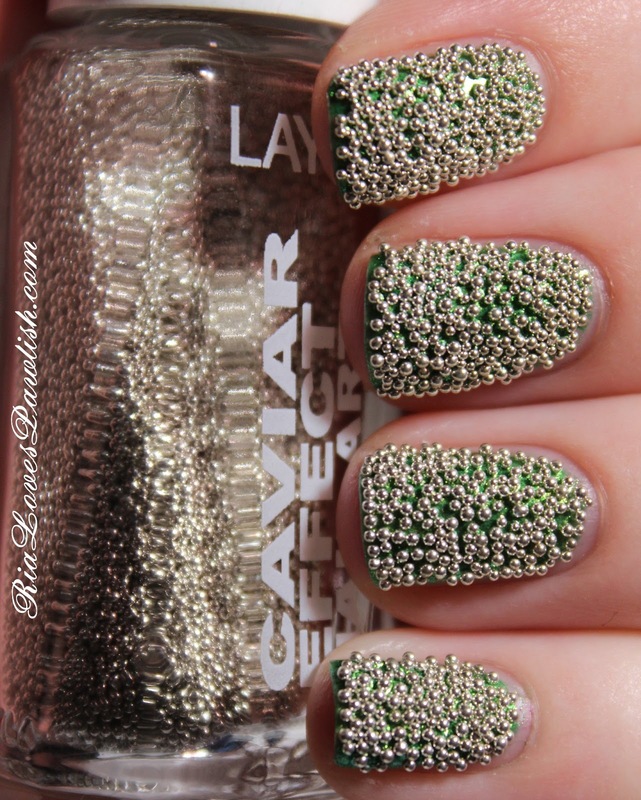 Caviar Effects are really easy to use. i started with one coat of Ipanema Girl, let that dry, then applied another coat of Ipanema Girl. before that coat dried, i poured Cha Cha Cha completely over that nail, then pressed the beads in to make sure they were all stuck down really well. i went nail by nail with this, to make sure that the nail would be wet enough to get the beads to stick! you don't need topcoat with this, but i did try putting on a coat because i'm a picker and i was worried that i would just sit there and pick off all the beads. adding topcoat dulls the beads a bit, but it still looks nice... just not quite as pretty and shiny. this is two coats of Ipanema Girl covered with a layer of Caviar Effect 01 Cha Cha Cha! 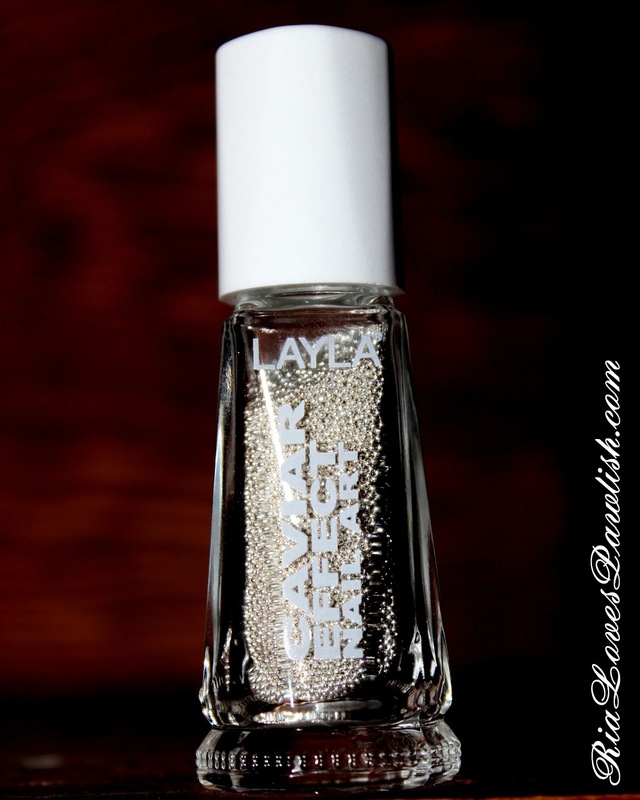 you can purchase Layla polishes at Aveyou.com and Zappos.com, Caviar Effects retail for $10.50! i spent today cleaning horse tack... it was so dirty it took pretty much the whole day! i was shocked by how much the saddle changed color once it was conditioned and oiled... i knew it would some, but it really got a lot darker. i put my new stirrup leathers on, they don't match exactly but they'll do for now. i'm not sure if i'm going to keep the bridle i bought... it's not the perfect color and i don't think i love it as much as i did in the picture. i so wish there was a good tack store around here, i much prefer seeing things in person first. 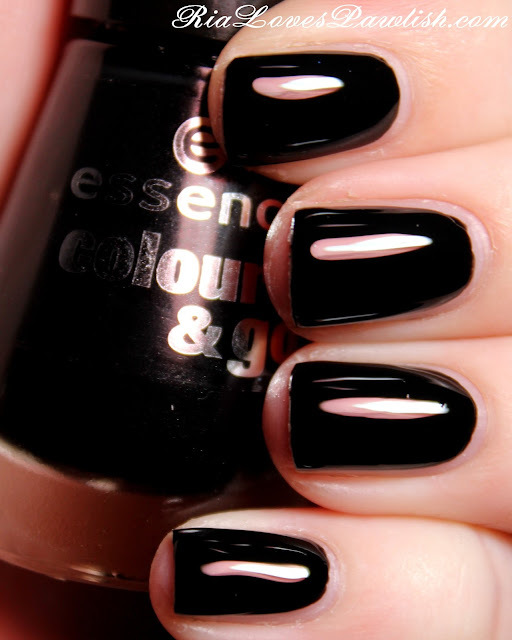 i decided to put Essence Colour & Go Space Queen over yesterday's post polish, Essence Black Is Back. Space Queen is an iridescent glitter in an ever so slightly peach tinted base. it goes on really easily and gives a great amount of glitter in one coat. i love how it looks over black, it really brings out all the colors in the glitter. you will want to add a shine topcoat to make the glitter really come alive. 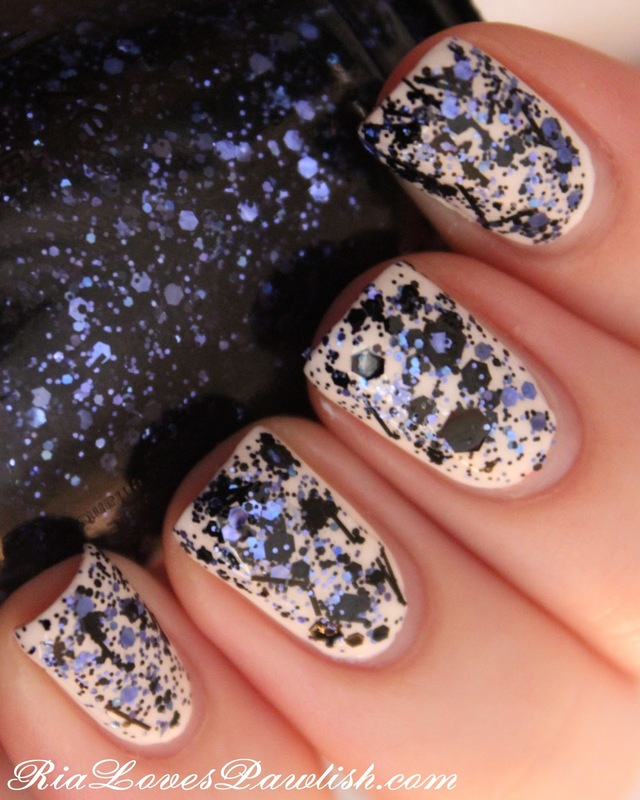 one coat Space Queen, one coat Seche Vite, all over Essence Black Is Back mani. it poured all night last night, so i didn't get to go riding today... i did head over the barn to pick up my saddle so i can wash it this weekend, though. glad i wasn't planning to ride, there were loads of puddles everywhere! today's polish is Essence Colour & Go Black Is Back, your basic black creme. however, it has an amazing formula and glossy finish that make it the best black creme i've used to date! it has full opacity at one coat and looks absolutely dreamy at two. i did use a topcoat with it, but only to help dry it... i don't know what it is about my body chemistry that keeps polishes from drying! two coats Black Is Back, one coat Seche Vite. Essence polishes just continue to blow my mind... all for $1.99! it's just crazy. i'm hoping they have a white creme that is just as opaque and glossy as this one... that would be awesome! i'm excited to share with you all the things i bought with my Ulta rewards... i had saved up 2000 points so i had $125 to spend... that was pretty awesome! i bought some necessities like cotton balls and toner that i won't bore you with... but i got some great beauty products :D let's kick it off with nail polish! first up we have the OPI Mariah Carey collection... unfortunately, they were out of the glitter and i haven't been able to find it anywhere. i might have to score that one off Ebay. this collection debuted the new Liquid Sand finish... looking forward to trying those babies out. OPI polishes have gone up to $9, i couldn't believe it! 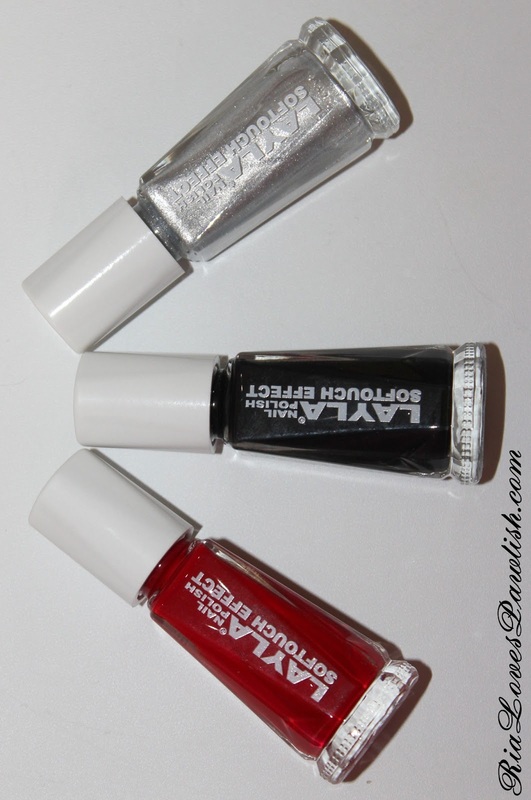 then i got the last three Layla Softouch Effect polishes that i was missing, i love polishes that pull double duty! 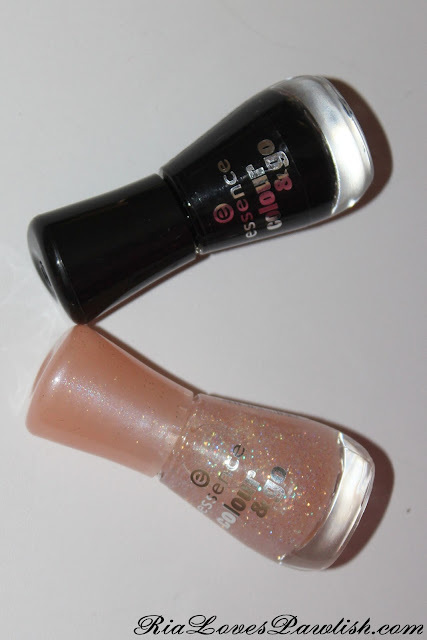 i got a couple more Essence polishes... even though the price has gone up to $1.99, they are still a great deal. i'm curious as to how well their black will perform, and if it will stamp! 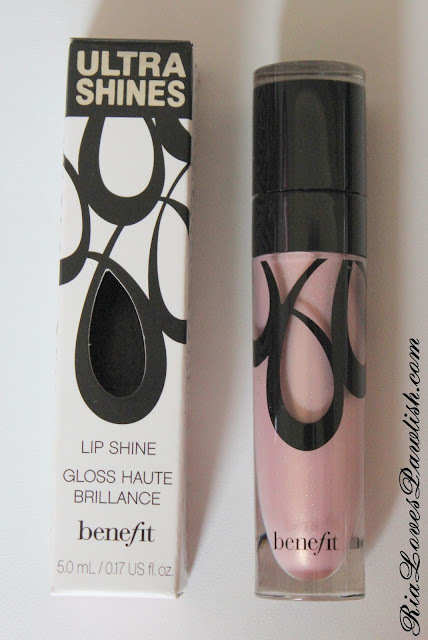 lastly, i got a lipstick and a lip gloss from Benefit. i have never tried any of their lip products, so i figured now was the perfect time. i'm digging them so far! finally, i got a Revlon Lip Butter. the other two in the picture i had bought at CVS the day before, so i wanted to throw them in :) there's so much hype on these, i'm still trying them out to see how well they live up to it. review on these maybe next week! it was a beautiful day today, such a nice day for horseback riding! i'm sure going to miss the weather here when we move back to the South... the weather there is basically never ideal, it's always too hot or too cold. i feel like the move is coming up way too fast, my husband is already meeting with his detailer about getting orders for the next place! i bought the whole collection from the seller Enospring on Ebay, it has not been officially released yet! 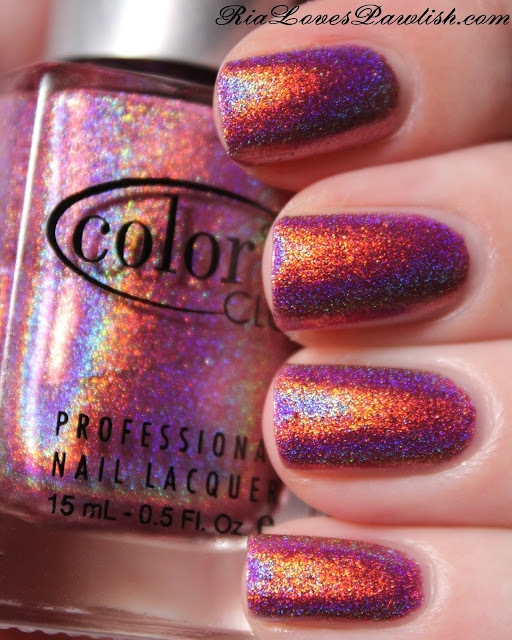 however, i got an email from Color Club today talking about preordering it, so i would imagine it's coming out soon. i have had a terrible experience ordering directly from Color Club, i still haven't received one of the original Halo Hues i ordered months ago... so, i recommend not ordering directly through them! hope you all have enjoyed this collection, i really do love it! it's not the best holographic collection out there, but it is certainly way more wallet friendly than my faves, the Layla Holograms. missed out on riding today, i woke up at like 4:30 am sick... i don't know why, maybe i ate something that didn't agree with me? so i slept most of the day, but i feel better now. i hope it's gone for good so i can go to my riding lesson tomorrow! today's polish is Eternal Beauty from the 2013 Color Club Halo Hues collection (Colors So Heavenly). it's a deep lavender purple linear holographic. i feel like this one isn't as holo as some of the lighter colored polishes in this collection, but it is still quite holographic. 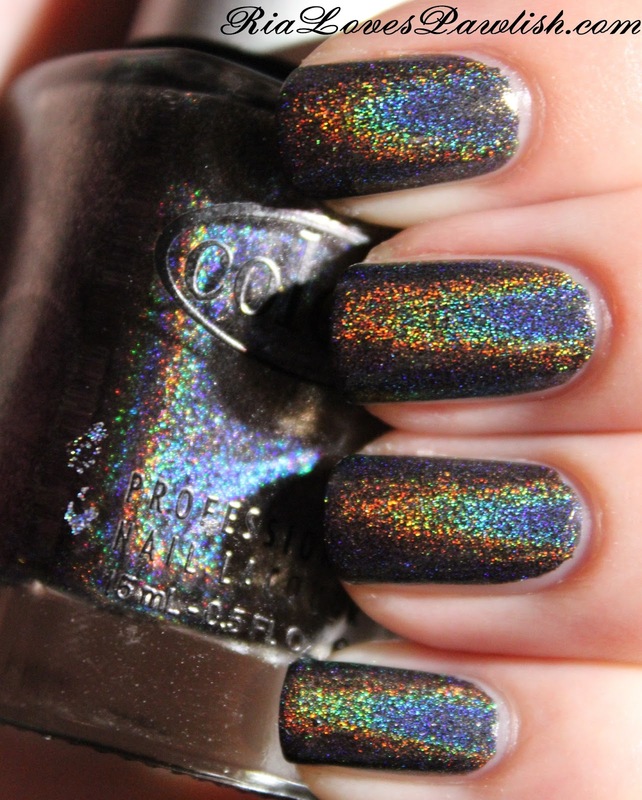 topcoat only slightly affects the linear effect of the holo, but the swatch photo is taken without topcoat. the formula is great, two easy coats for full opacity! i bought the whole collection from the seller Enospring on Ebay, it has not been officially released yet! i'm trying to be on a diet, but i always end up so hungry right around 9pm. it's terrible! i don't know why that's the magic hungry moment for me. i've known people who say that whenever they get hungry they can just drink a glass of water and it goes away... why can't that be me?! no matter how much water i drink, i'm always still hungry. *le sigh* moving on to the polish! 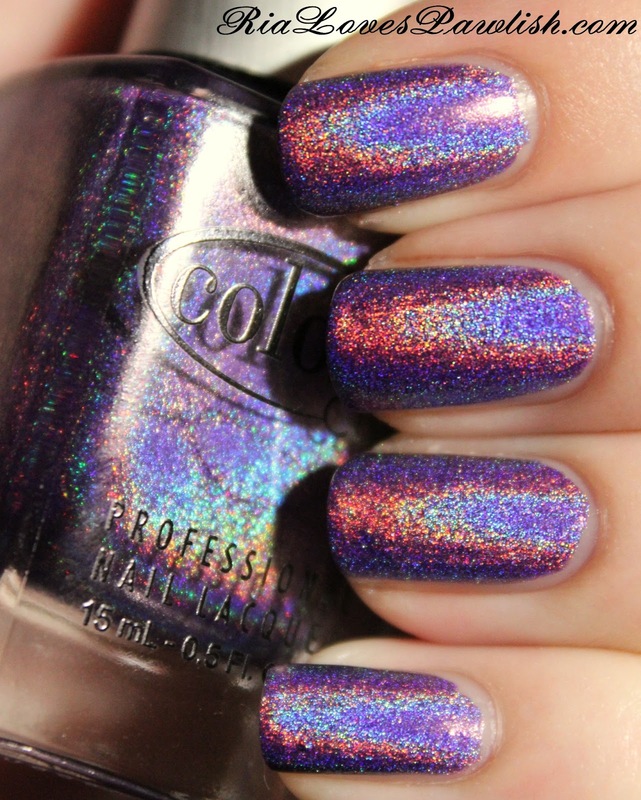 today's polish is Cosmic Fate from the 2013 Color Club Halo Hues collection (Colors So Heavenly). it's a light orange/peachy linear holographic... and it's yummy! 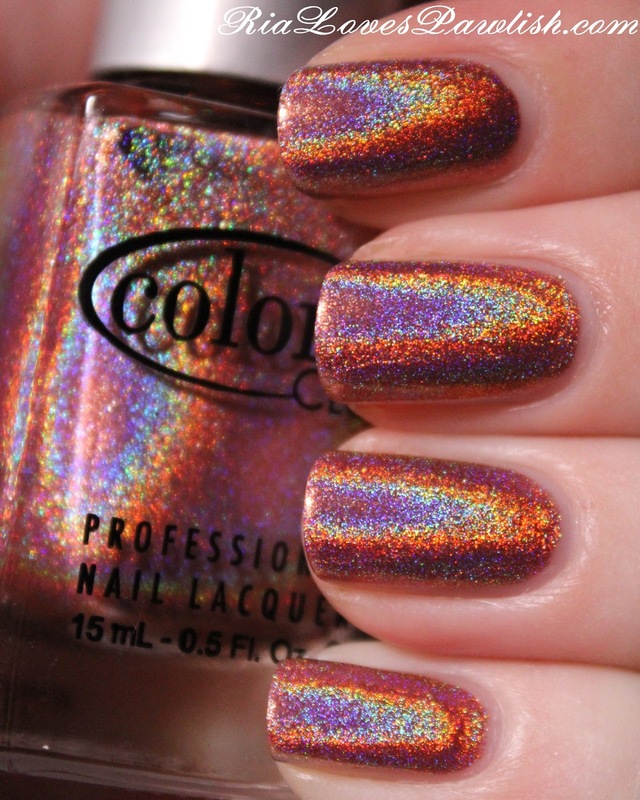 the holo in this one is super strong AND is barely if at all affected by the addition of topcoat... home run! the formula is great, easy to work with and fully opaque in two coats. my swatch is shown without topcoat! 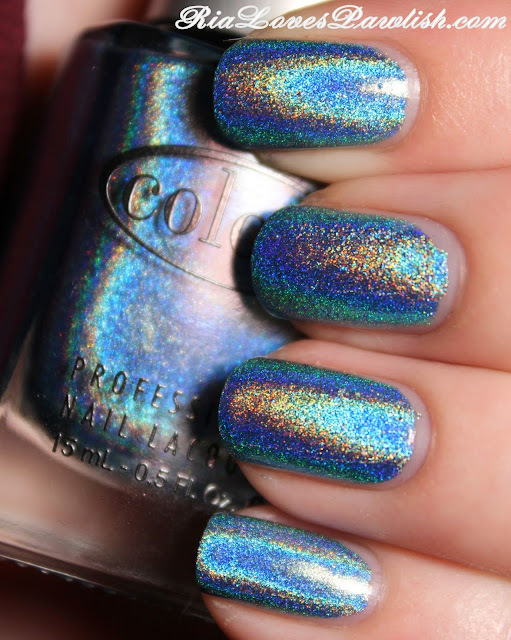 today's polish is Kismet from the 2013 Color Club Halo Hues collection (Colors So Heavenly)! it's a light green-leaning yellow linear holographic... so pretty! the formula was amazing, two coats for full opacity. i was worried that this light color would be sheer... but no let downs here! another great thing about this polish is that topcoat barely dulls the linear holo effect, much less than others in this collection. this swatch is shown without topcoat, however. 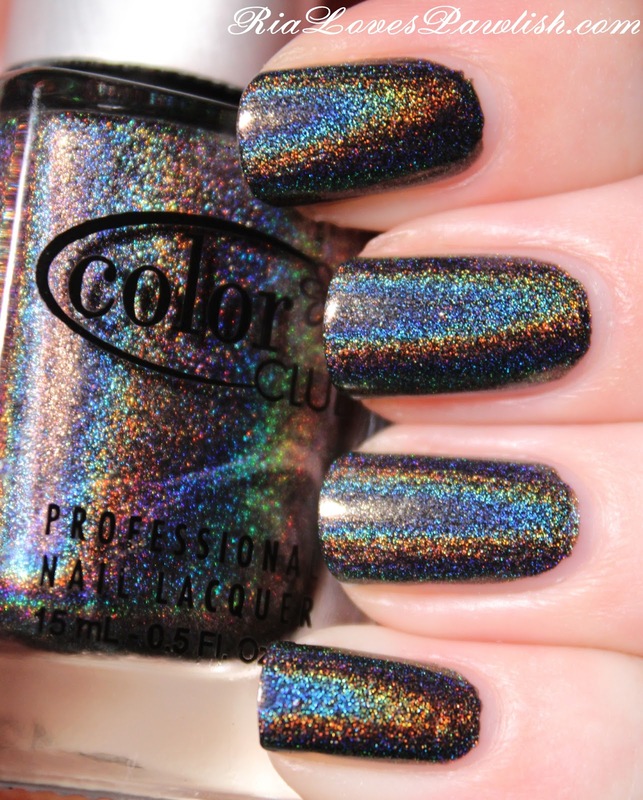 Miss Bliss is today's 2013 Color Club Halo Hues (Colors So Heavenly) polish! this is a rose pink linear holographic... and man, is it holo! the holographic effect is super strong in this one, i can't stop staring at my nails :D the formula is great, so easy to apply... i used two coats just to make sure and avoid any patchiness. top coat slightly dulls the linear holo effect, so this swatch is shown with no topcoat! i just had to show a couple shots of this beauty! i bought the whole collection from the seller Enospring on Ebay, it has not been officially released yet. pretty laid back day today, tried out the saddle and i think it's going to work, which is exciting! other than that we just ran some errands... which now reminds me that i forgot to give the dogs their medicine, which was what i had to pick up today! ugh i'd forget my head if it wasn't attached so tight. i'll just have to try for tomorrow since they have to take it with food. it's nice that they're taking Trifexis, which has their heartworm and flea protection all in one... i don't miss using those flea drops on their back at all! 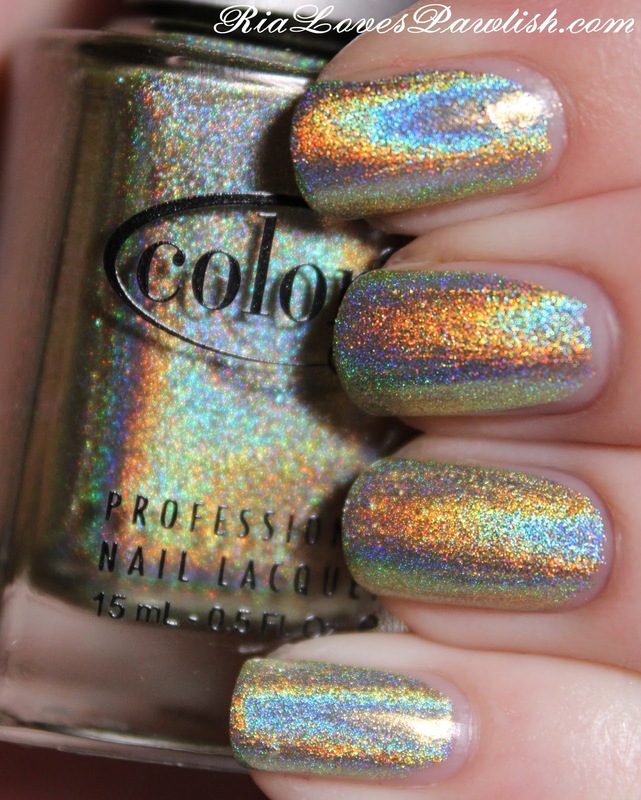 today i'm super excited to kick off sharing the Color Club 2013 Halo Hues collection, 'Colors So Heavenly'! 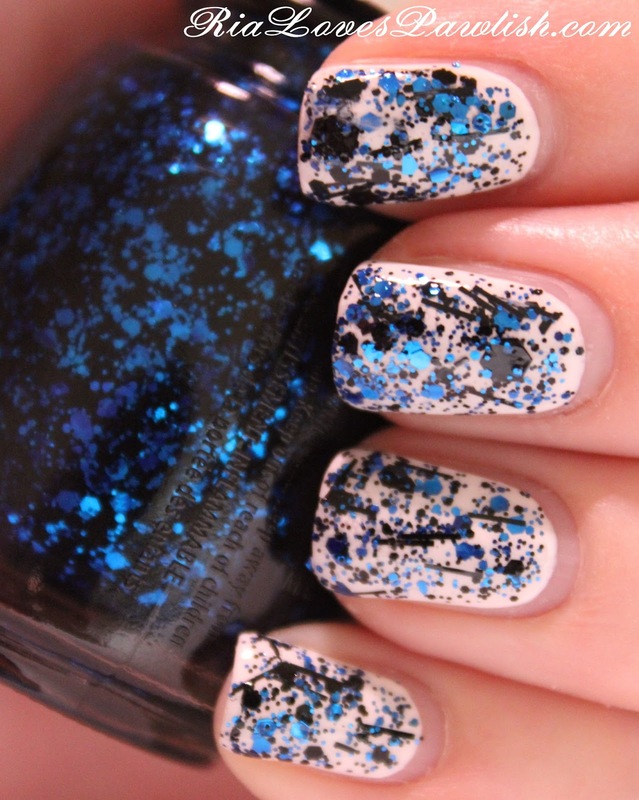 we're starting off with Over The Moon, a saturated holographic blue... and it's yummy! i was worried that the holographic properties wouldn't be very strong... but happily, the whole collection is full of strong, linear holos... doesn't get better than that. and the formula is great, good coverage at one coat and any patchiness is completely gone at two coats. the holo is dulled a little bit by topcoat, but it's still pretty evident. the swatch is shown without any topcoat! two coats Over The Moon.